Crazy how scarce time is when you have a little one but I finally made time to write up this review on the DoubleTree by Hilton Melbourne. Owned by M&L Hospitality of Singapore and managed by Hilton, both businesses have ambitious growth plans in Australia. M&L is currently undertaking a AU$320 million redevelopment and expansion of the Four Points by Sheraton Hotel in Sydney overlooking Darling Harbour, and it also owns amongst others the Swissotel Sydney and Travelodge Docklands. On the other hand, Hilton Worldwide operates more than 400 DoubleTree hotels across 33 countries which are generally priced below and smaller than the flagship Hilton hotels. This latest Melbourne property is the fourth DoubleTree hotel opening in just two years and there are plans to double this. 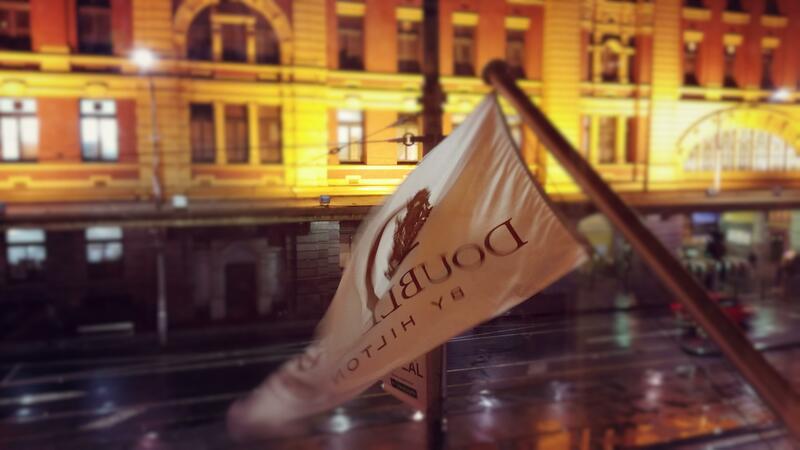 Launched in December 2014 following a multi-million dollar refurbishment of the former Citigate Hotel on Flinders Street, conveniently across Flinders Street Station, the DoubleTree by Hilton is a welcomed addition to the Hilton portfolio and Melbourne City. Centrally located, this 180-room hotel took inspiration from Melbourne’s famous laneways and Flinders Street station for its sleek industrial retro design. The complete refurbishment from head to toe, inside and out, led by Michael McCann of Dreamtime Australia Design and Melbourne based interior designer Melissa Chen of Mill Interior saw the duo shortlisted for two major international interior design awards, the 2015 World Interior News Awards and the 2015 Interior Design Excellence Awards. Steel panels that feature at the hotel entrance and throughout the lobby give it an industrial feel but a signature warm chocolate chip cookie on arrival immediately melts the coolness away and creates a home away from home touch. No detail was spared in refurbishment from textured wall covering, carpets, curved headboards to the black and white photography. The King Guest Room is perfectly functional but if you were travelling with a few pieces of luggage and like to unpack everything, then the wardrobe space is on the light side. The black and white bathroom is spacious, inviting and complemented by Crabtree & Evelyn toiletries. Inside the DoubleTree Melbourne, there’s an onsite restaurant and bar – Platform 270 – for all day dining or opt for room service. Dinner was average but convenient enough particularly if you bump into one of Melbourne’s wet and cold nights. The buffet breakfast offered plenty of variety, from your hot foods to a selection of pastries and fresh juice, coffee or tea. If Platform 270 doesn’t fit your appetite, there’s an abundance of restaurants and food outlets around the hotel. Overall, the DoubleTree by Hilton Melbourne is a great addition to the Melbourne business/leisure hotel market, and even better for Hilton Honor members. With the exit of the Albert Park Hotel (now Pullman), the only other Hilton option is the Hilton South Wharf, whilst close, it’s not in the CBD. You can’t fault the DoubleTree’s convenient location, add a successful multi-million dollar renovation, reasonable prices, and good service, that’s a recipe for success.